2018 sgCarMart Star Merchant, Kim Hoe & Co. Pte Ltd, is proud to announce its newly unveiled showroom and online e-commerce store. of specially selected tyre dealers. refreshments and a TV, as well as a Pirelli and Formula One tyre display. company believes in and how it operates its business. With the launch of Kim Hoe & Co.’s new online e-commerce store, shopping for tyres is just a click away; 24 hours a day, seven days a week. Kim Hoe & Co. has been in love with tyres since 1974 and has been sharing that love by helping people to find the right tyres at the right price. 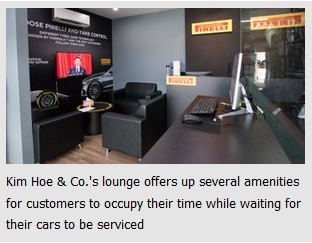 Kim Hoe And Co. Pte Ltd has also been recognised as an sgCarMart Star Merchant 2018 in the tyres & rims category for its service excellence.